The seasoning of wood is important for several reasons. It reduces weight, it increases strength, it prevents changes in volume after it is worked into shape, and it prevents checking and decay. Decay can also be prevented by submergence and burying, if by so doing logs are kept from fungal attacks. The piles of the Swiss Lake dwellings, which are in a state of good preservation, are of prehistoric age. Wood under water lasts longer than steel or iron under water. But for almost all purposes wood has to be dried in order to be preserved. The wood is cut up, when green, to as thin pieces as will be convenient for its use later, for the rate of drying depends largely upon the shape and size of the piece, an inch board drying more than four times as fast as a four inch plank, and more than twenty times as fast as a ten inch timber. (1) Natural or air-seasoning is the most common, and in some respects the best. In this method, the wood is carefully and regularly piled in the seasoning-yard, so as to be protected as far as possible from sun and rain, but with air circulating freely on all sides of the boards, Fig. 47, see . To accomplish this, “sticking” is employed, i. e., strips of wood are placed crosswise close to the ends and at intervals between the boards. In this way the weight of the superposed boards tends to keep those under them from warping. The pile is skidded a foot or two off the ground and is protected above by a roof made of boards so laid that the rain will drain off. Fire-wood is best dried rapidly so that it will check, making air spaces which facilitate ignition, but lumber needs to be slowly dried in cool air so that the fibers may accommodate themselves to the change of form and the wood check as little as possible. Good air-drying consumes from two to six years, the longer the better. (2) Kiln-drying or hot-air-seasoning is a much more rapid process than air-seasoning and is now in common use, Fig. 57. The drying is also more complete, for while air-dried wood retains from 10% to 20% of moisture, kiln-dried wood may have no more than 5% as it comes from the kiln. It will, however, reabsorb some moisture from the air, when exposed to it. The wood of conifers, with its very regular structure, dries and shrinks more evenly and much more rapidly than the wood of broad-leaved trees, and hence is often put into the kiln without previous air-drying, and dried in a week or even less time. Oak is the most difficult wood to dry properly. When it and other hardwoods are rapidly dried without sufficient surrounding moisture, the wood “case-hardens,” that is, the outer part dries and shrinks before the interior has had a chance to do the same, and this forms a shell or case of shrunken, and often checked wood around the interior which also checks later. This interior checking is called honeycombing. Hardwood lumber is commonly air-dried from two to six months, before being kiln-dried. For the sake of economy in time, the tendency is to eliminate yard-drying, and substitute kiln-drying. Kiln-drying of one inch oak, takes one or two weeks, quarter-sawn boards taking one and a half times as long as plain-sawn. The best method of drying is that which gradually raises the temperature of both the wood and of the water which it contains to the point at which the drying is to take place. Care is therefore taken not to let the surface become entirely dry before the internal moisture is heated. This is done by retaining the moisture first vaporized about the wood, by means of wet steam. When the surface is made permeable to moisture, drying may take place rapidly. Curtains of canvas are hung all around the lumber on the same principle that windows in newly plastered buildings are hung with muslin. The moisture is absorbed on the inner surface of the curtain and evaporates from the outer surface. Improvements in kiln-drying are along the line of moist air operation. In common practice, however, the moist air principle is often neglected. There are two methods in operation, the progressive method and the charge method. In the progressive, the process is continuous, the loads going in at one end of the kiln, and out at the other, the temperature and the moisture being so distributed in the kiln, that in passing from the green to the dry end, a load of lumber is first moistened, then heated, and finally dried out. In the charge system, the process is intermittent, one charge being removed before a new one is admitted. This gives the best results with high grade lumber for special uses. A modification of hot-air-seasoning is that which subjects the wood to a moderate heat in a moist atmosphere charged with the products of the combustion of fuel. (3) Small pieces of wood may be effectively seasoned by being boiled in water and then dried. The process seems to consist of dissolving out albuminous substances and thus allowing freer evaporation. Its effect is probably weakening. (4) Soaking in water is sometimes used as a good preparation for air-seasoning. Previous soaking hastens seasoning. River men insist that timber is improved by rafting. It is a common practice to let cypress logs soak in the swamps where they grow for several months before they are “mined out.” They are eagerly sought after by joiners and carpenters, because their tendency to warp is lessened. Ebony is water-soaked in the island of Mauritius as soon as cut. Salt water renders wood harder, heavier, and more durable and is sometimes applied to ship timbers, but cannot be used with timbers intended for ordinary purposes, as the presence of salt tends to absorb atmospheric moisture. (5) Boiling in oil is resorted to for special purposes, both for preservation and to give strength. For example, the best handscrews are so treated. The oil also prevents glue from sticking, the most frequent cause of injury to handscrews. (6) There are a number of “impregnation” methods of preserving timber, and their practice is spreading rapidly. Of the various preservative processes, those using coal tar creosote and zinc chloride have proved most efficient. The purpose is to force the preservative into the pores of the wood, either by painting, soaking, or putting under pressure. Such impregnation methods double or treble the life of railway ties. It is now being used with great success to preserve electric wire poles, mine-props, piling, fence-posts, etc. Wood preservation has three great advantages, it prolongs the life of timbers in use, reduces their cost, and makes possible the use of species that once were considered worthless. For example, the cheap and abundant loblolly pine can be made, by preservative methods, to take the place of high priced long-leaf pine for many purposes. PRACTICAL SUGGESTIONS FOR STORING LUMBER. Under the hasty methods prevalent in the mill, very little wood comes to the shop well seasoned, and it should therefore be carefully stored before using, so as to have the fullest possible air circulation around it. Where the boards are large enough, “sticking” is the best method of storage, i. e., narrow strips of wood are placed at short intervals between the pieces which are piled flat. The weight of the boards themselves helps to prevent warping. Boards set upright or on edge are likely to be distorted soon. It is often wise to press together with weights or to clamp together with handscrews boards that show a tendency to warp, putting the two concave sides together. Then the convex side is exposed and the board may straighten thus: Fig. 58. By wrapping up small boards in paper or cloth in the intervals between work on them, they may be kept straight until they are assembled. Fig. 58. Clamping up Boards to Prevent Warping. Another precaution to take is to be sure to plane both sides of a board if either is planed, especially if the board has been exposed to air-drying for some time. Lumber is a general term for all kinds of sawn wood. Logs may be sawn into timber, that is, beams and joists, into planks, which are 2″ to 4″ thick, or into boards which are from ¼” to 1¾” thick. These may be resawn into special sizes. Any of these may be dressed down to thinner boards, or resawn on a special band-saw. If a piece wanted is short the way the grain goes, the order would be the same, thus: ¾” × 11″ (wide) × 6″ (long). That is, “long” means the way the grain runs. It is always safe to specify in such a case. It is common when small pieces are ordered to add one-quarter to the cost for waste. In large lots lumber is ordered thus: 800′ (B. M.) whitewood, dressed 2 sides to ⅞”, 10″ and up. This means that the width of any piece must not be less than 10″. Prices are usually given per “M,” i. e., per 1000 ft.: e. g.: basswood may be quoted at $40.00 per M.
When thin boards are desired it is often economical to buy inch stuff and have it resawn. Some lumber is also ordered by the “running” or lineal foot, especially moldings, etc., or by the piece, if there is a standard size as in fence-posts, studs, etc. Laths and shingles are ordered by the bundle to cover a certain area. 1000 4″ shingles (= 4 bundles) cover 110 sq. ft. with 4″ weather exposure. 100 laths (1 bundle) each ¼” × 1½” × 4’0″ cover about 150 sq. ft. 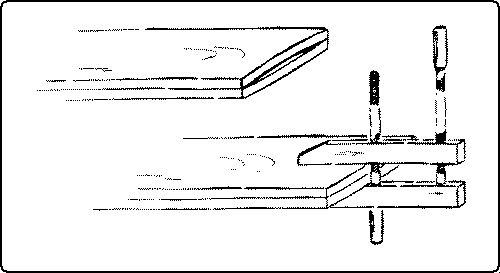 There are several methods of measuring lumber. The general rule is to multiply the length in feet by the width and thickness in inches and divide by 12, thus: 1″ × 6″ × 15′ ÷ 12 = 7½ feet. The use of the Essex board-measure and the Lumberman’s board-measure are described in Chapter 4.